Wakeboarding puts you face-to-face with the waves and directly in the reflection of the glare off the surface of the water. It is similar to surfing, but the body is used instead of a board and you are in the water, instead of surfing on top of it. The sun is even more fierce when your face is level with the water - the glare is intensified and the UV radiation penetrates your eyes. Body boarding sunglasses, like surfing sunglasses, help to defend the eyes which decreases the change of eye health problems. Not many people know that the eyes can get sunburned and this can lead to more serious eye issues. Sunglasses for wakeboarding are the same as surfing sunglasses. As the waves and water splash up at your face the surfing sunglasses decrease the exposure and allow the water to run-off. The hard-pounding water requires strong frames and an effective ventilation systems that keeps both the air and water flowing away from your face. A curved frame and with polarized lenses provides maximum coverage to protect the bodyboarder and surfer's eyes. And there's a strap to keep the surfing sunglasses on your head so you can stay out in the water for a long time. Goggles may fog and cannot be worn comfortably for long sessions. Prescription wakeboarding sunglasses - choose your color frame and lenses! The best wakeboarding sunglasses defend against the powerful ocean waves and brutal sun glaring off the water. Because the bodyboarder is both in and on top of the water the salt and blinding rays of the sun take a toll on the eyes. Curved lenses with polarization and 100% UVA and UVB protection are standard equipment. A strap that can be adjusted with one hand allows for long-term comfortable wear. Different sunlight requires optional lens tints like grey, brown and clear. 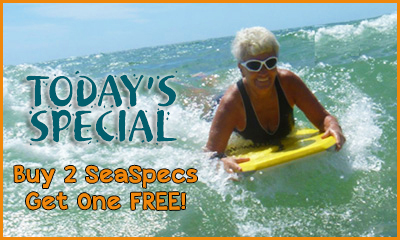 The three Best Body Boarding Sunglasses are Copper Blaze Specs, Tortuga Specs and Crystal Specs. Prescription Sunglasses for wakeboarding are a necessity as body boarder needs to see clearly at all times. Don't try to use contact lenses - they will pop out from the water washing up into your eyes. The same design features found in the best body boarding sunglasses are available in prescription - click here for simple and fast ordering.